Out of all of the products on the market, one stands out in my mind because of its unique attributes. The product I speak of is Ripple by Stillwater. With three varieties, (see below) there is something for everyone who prefers edibles as a delivery method for cannabis. Having tried each of the products, I want to hit on what I like about each and what kind of experience I had while enjoying them. With each packet containing 10mg of THC, this is my go to when I just want a fast-acting, lasting, consistent high. I like to utilize Pure 10 when I’m working on art projects, writing music, or want to stay focused on a task at hand. The beauty about this product (and honestly any of the Ripple products) is you can essentially add it to anything. I usually will sprinkle it on my food or add it to a glass of water for the delivery method but the choices are unlimited. This is the variation of Ripple I utilize the most. 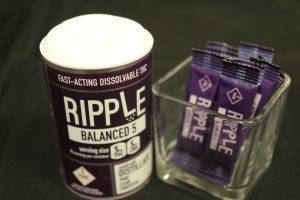 With a 1:1 combo of THC to CBD (5mg THC/5mg CBD), Ripple Balanced is my go to when I want a nice night of sleep. With the THC/CBD combo, it relaxes my mind and body. This has been my go to when I have nights of insomnia and it has worked quite well over the time I’ve been using Ripple Balance. I’m not a heavy users either, so the 5mg of THC still gives me a nice head high but the CBD comes in and relieves my body of any weight it’s holding. If you are interested in checking out a CBD product that is not heavy in THC, I highly recommend this product. With 10mg CBD and only .5mg of THC this product gives me a relaxing body feel and does not carry the head high I feel when using the other Ripple products. The time I utilize this product the most is pre or post workout. I’ve found that it helps me push through a tough, physically demanding workout and has also helped for recovery as well. 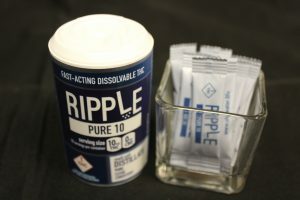 Ripple is a versatile product and it’s great that they offer a variety of options to choose from. 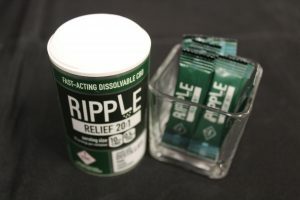 I make sure to always have all three Ripple products in my weed cabinet ready to go. You can find Ripple by Stillwater at Choice Organics in all three varieties. Also, if you have not already checked out the Product Overview video on Ripple click here to check out that video.